Europe – Sweden | faim? oui oui!!!!!! 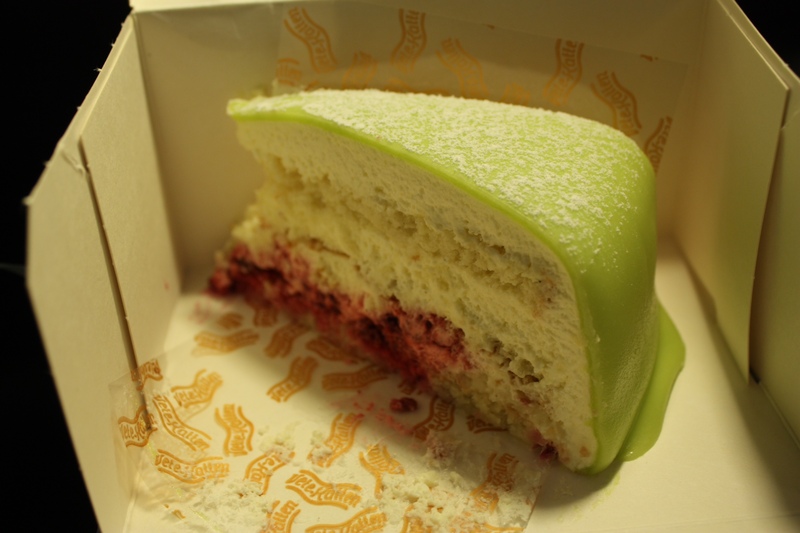 I still have one more item to check-of on my to-eat list: fika. 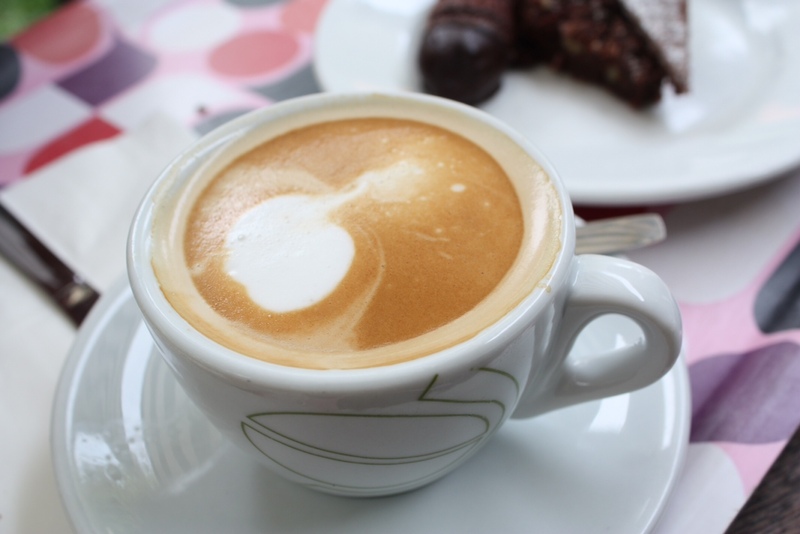 Fika is a Swedish term that means to have a drink and something sweet. 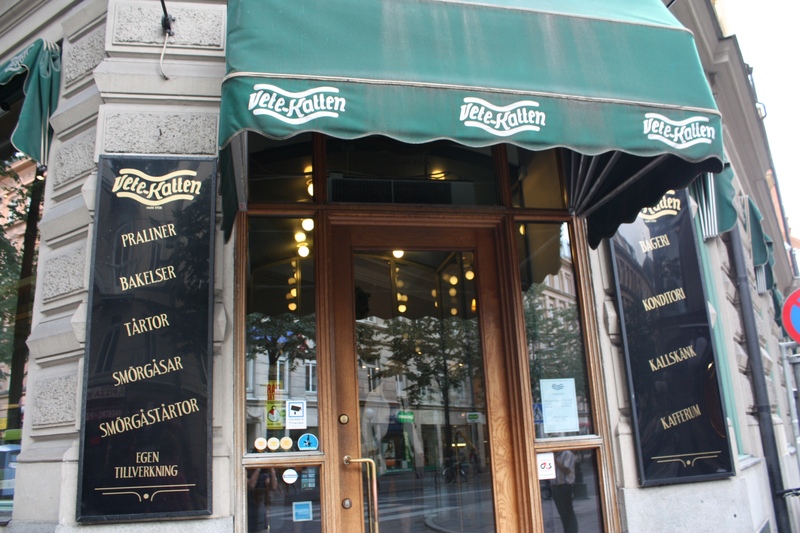 Near our hotel is Vete-Katten, one of the most famous cafe & bakery in Stockholm. 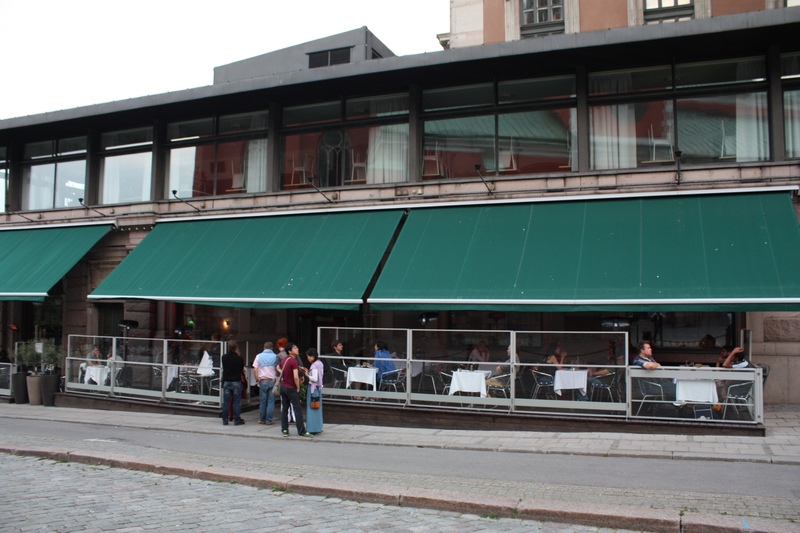 The last restaurant/beer hall I had to try in Stockholm is Pelikan. 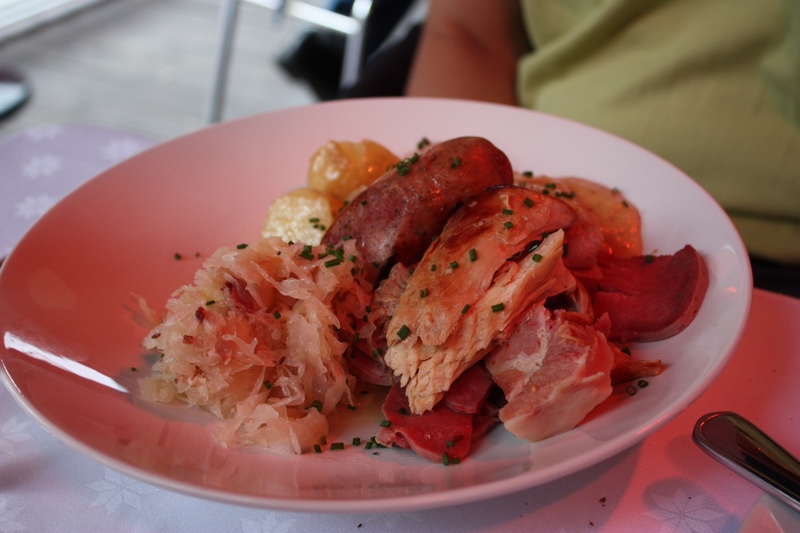 Pelikan is recommended by many guidebooks and foodies as a place to try traditional Swedish fare. 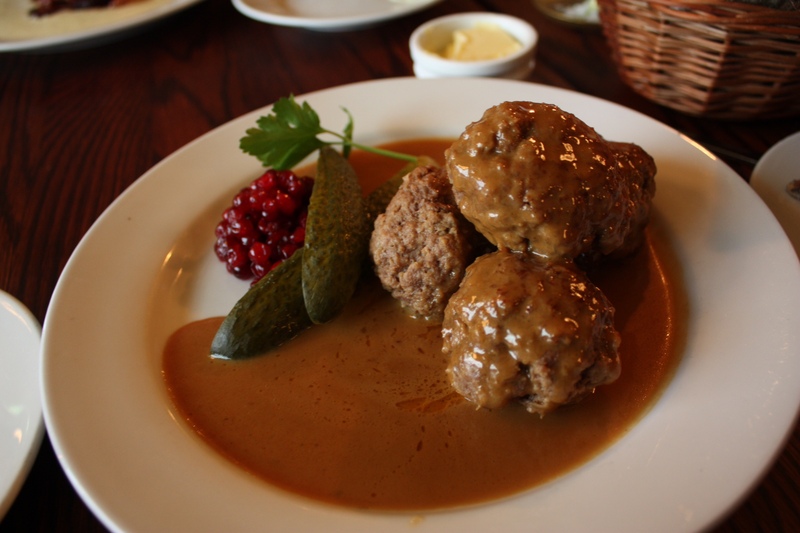 meatballs with cream sauce, gherkins and lingonberries… The meatballs are gigantic!!!! 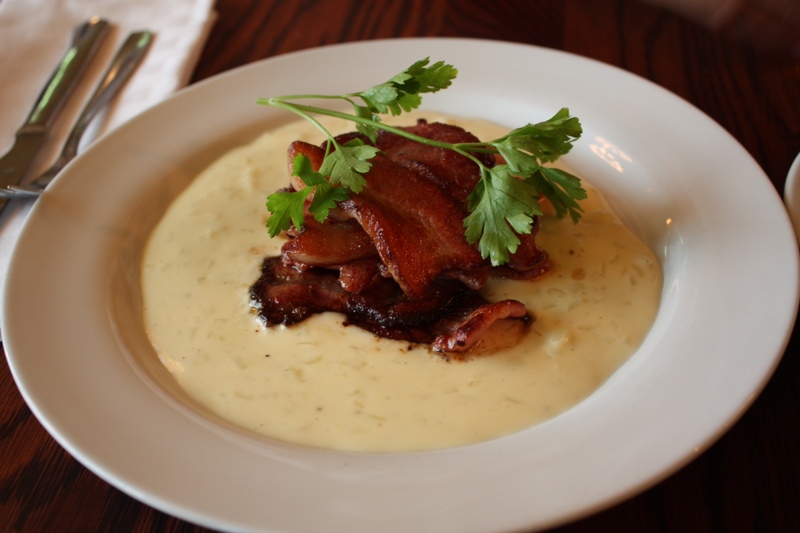 fried salted bacon with creamy onion sauce… only a few slices of bacon for 178 SEK! 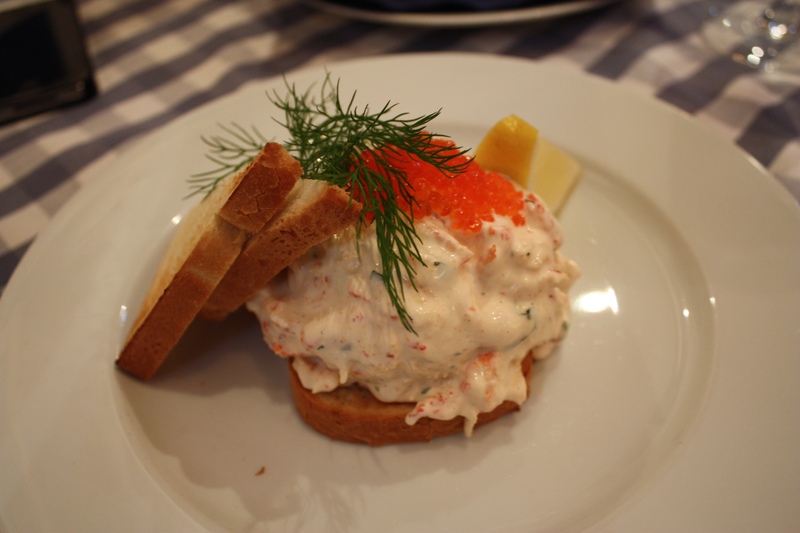 crayfish toast with lavaret roe… We just had the toast from Lisa Elmqvist for lunch, so in comparison, this did not taste fresh. 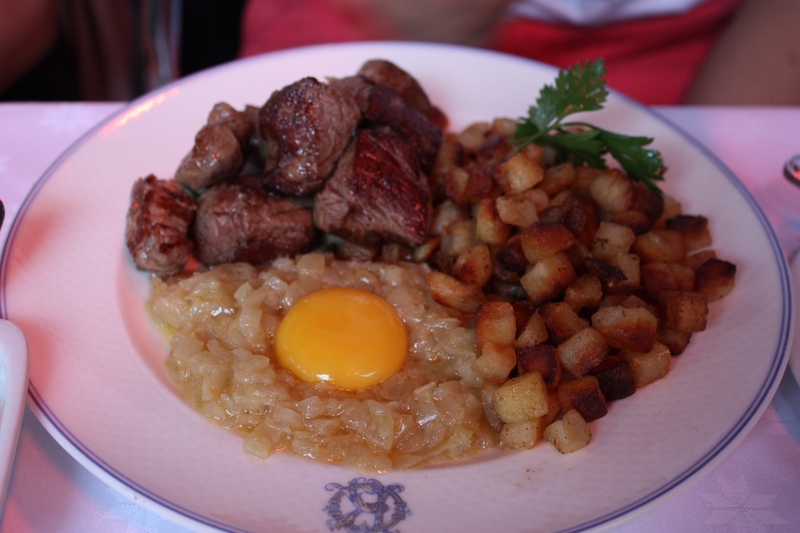 Swedish beefsteak with parsley butter, tomato salad and fried new potatoes…. 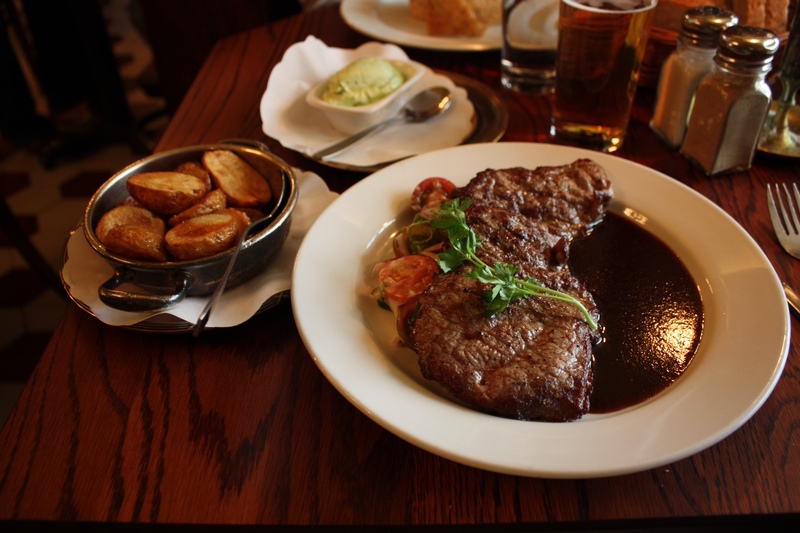 The steak was extremely tough…. Because we had such good meals previously, Pelikan was such a disappointment. 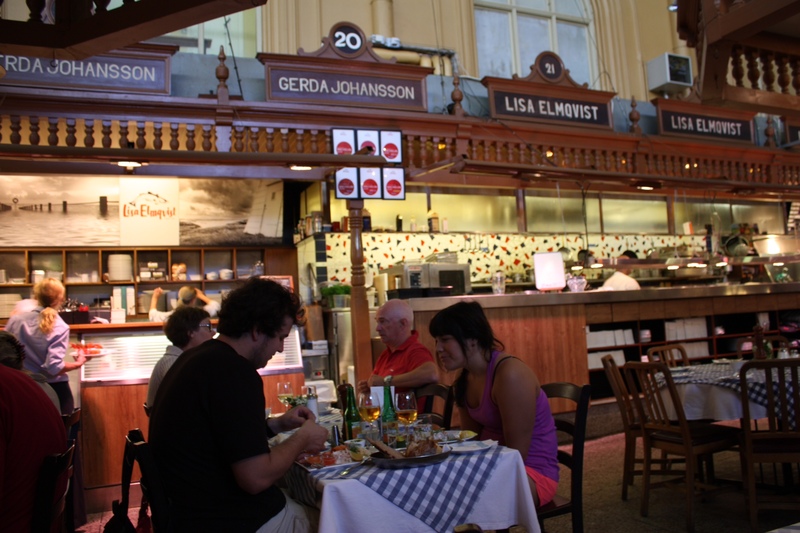 I wanted to try Lisa Elmqvist, a famous seafood restaurant at Östermalm’s Saluhall (food market) which is recommended by the Michelin guide. 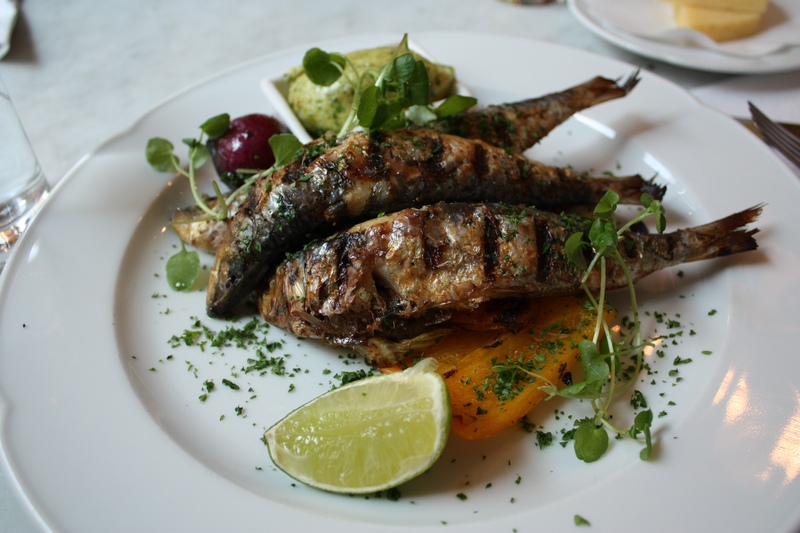 Lisa Elmqvist also sells seafood so we’re assured of the seafood quality! 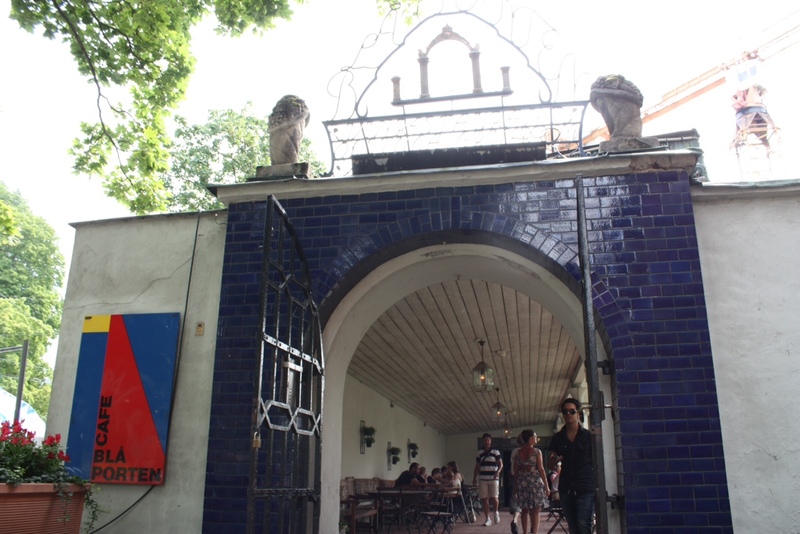 We asked for a table and the waitress seated us at Gerda Johansson, next to Lisa Elmqvist. She assured us that both restaurants are the same.. oddly enough, the names are different but the food comes from the same kitchen, has the same menu and same waiters. 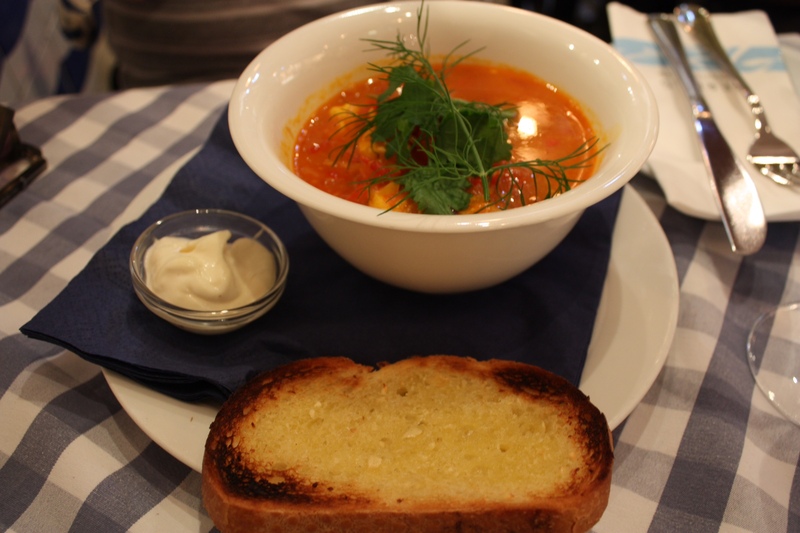 fish soup of the house with aioli and garlic bread.. my parents had the soup to share and they kindly split it for us. 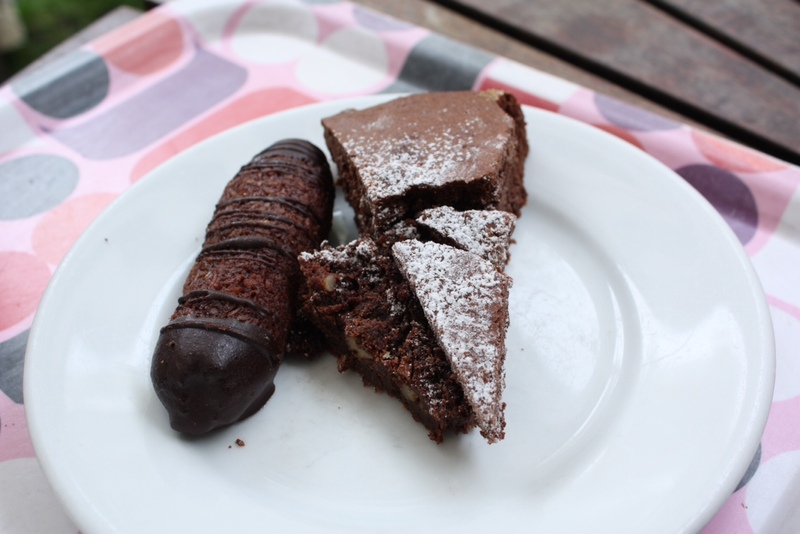 The half portion is presented like the regular portion! The fish soup tasted rich and had a lot of fish chunks. 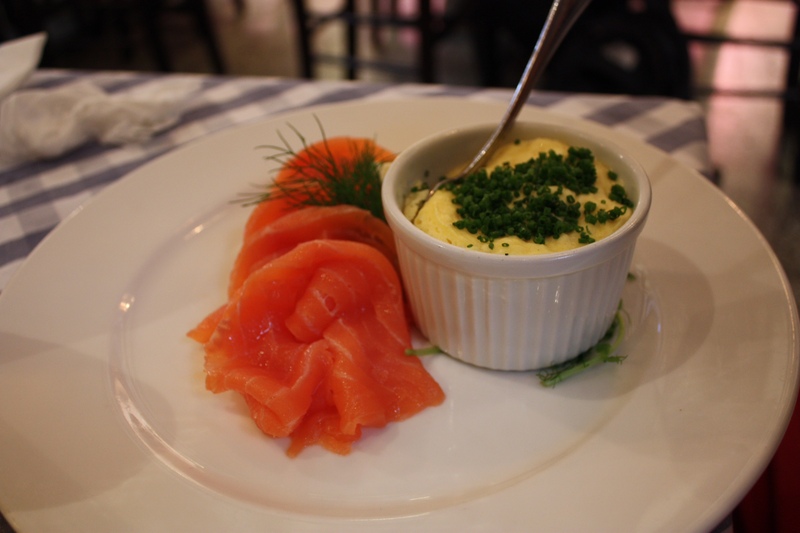 smoked salmon served with scrambled eggs…. 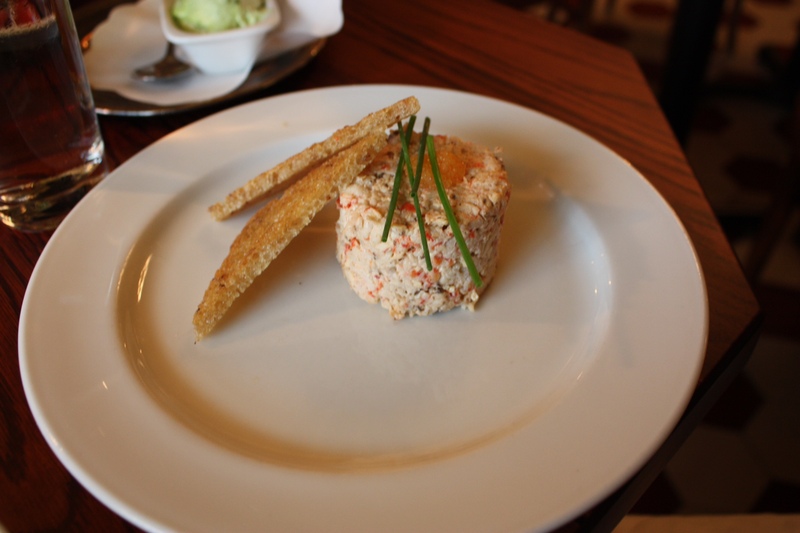 CRAY FISH TOAST with 200g cray fish tails, garlic, leek, mayonnaise and parsley on toast, garnished with trout roe…… This was amazing! Creamy and lots of fresh-tasting cray fish! 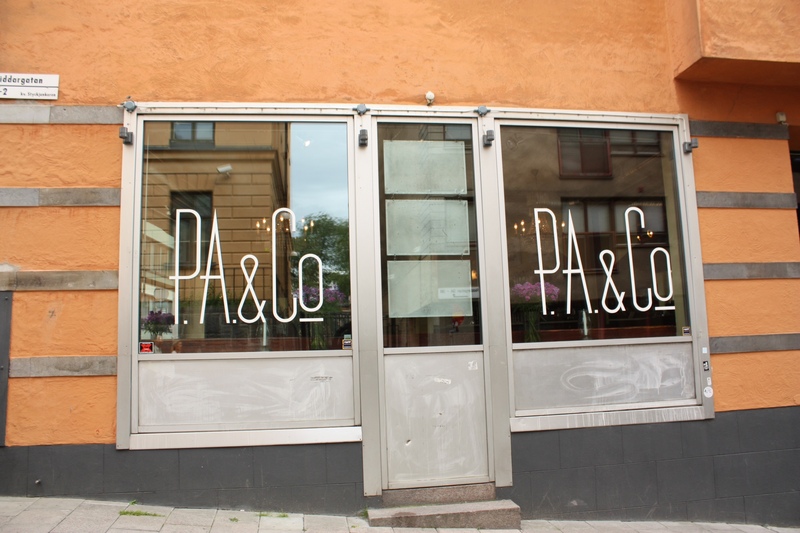 PA & Co serves contemporary Swedish food with a Asian/French twist and it was the best meal we had in Stockholm. Located in the posh area of Östermalm, PA & Co is a favourite among the city’s business, cultural and fashion elite. 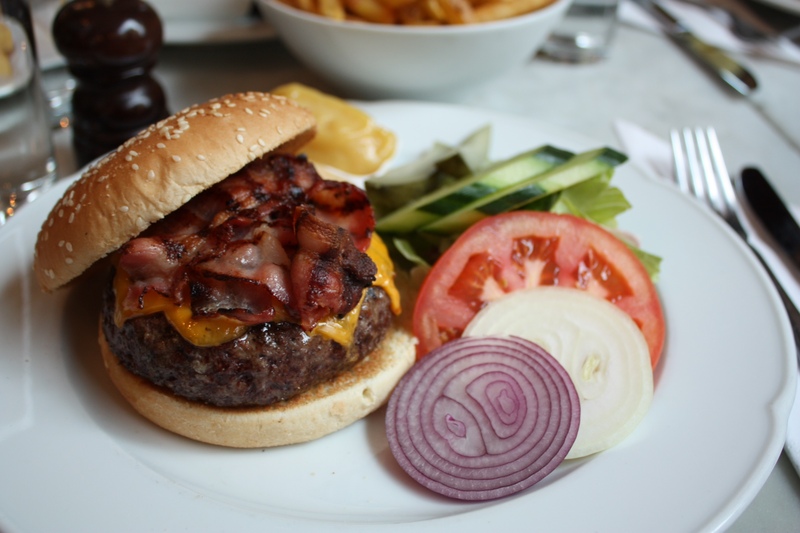 I was reading an article about Flippa K’s designer and she said her favourite restaurant in Stockholm is PA & Co! 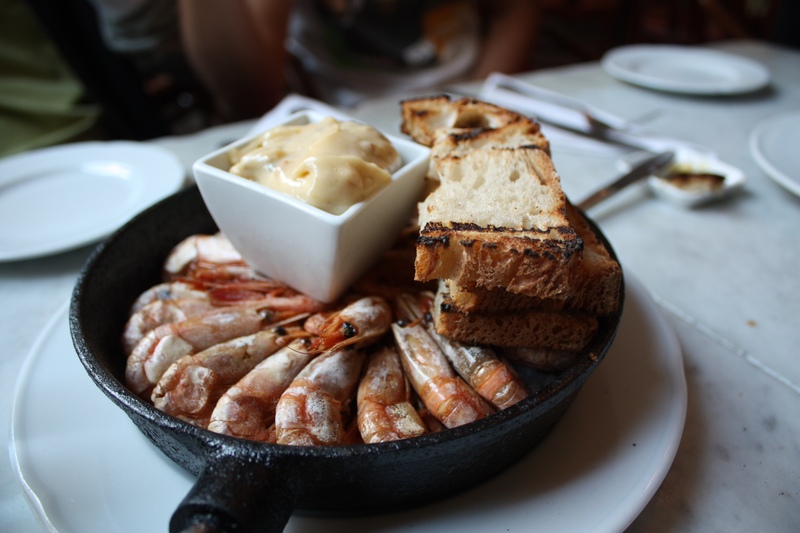 salt fried smoked shrimps with chipotle aioli… Such a neat presentation with the shrimps lying on a bed of sea salt… small succulent shrimps, mouthwatering aroma..amazing! clay pot herring… this is a twist from the traditional prepared herring because this version is served hot, which I liked better. 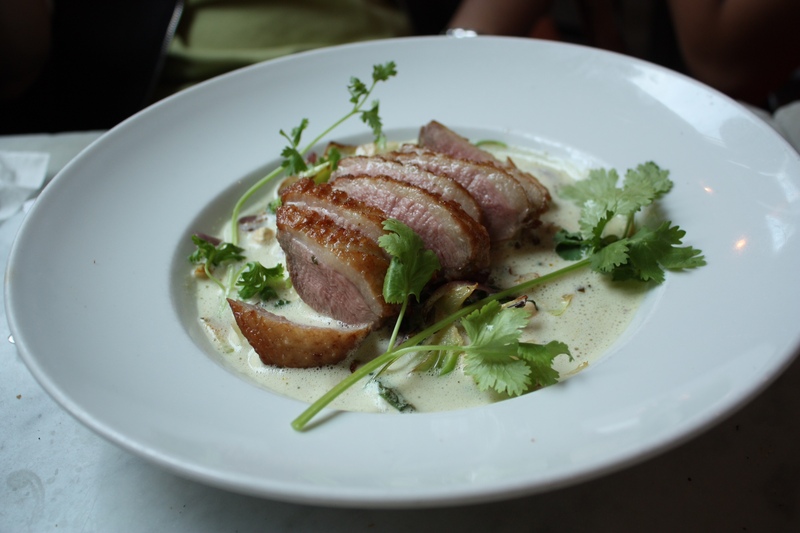 green curry with roasted duck breast, vegetables and cashew… dad loved this curry..
grilled sardines with mango/yuzu butter, vegetables and french fries…. one of the largest sardines I’ve ever tried! 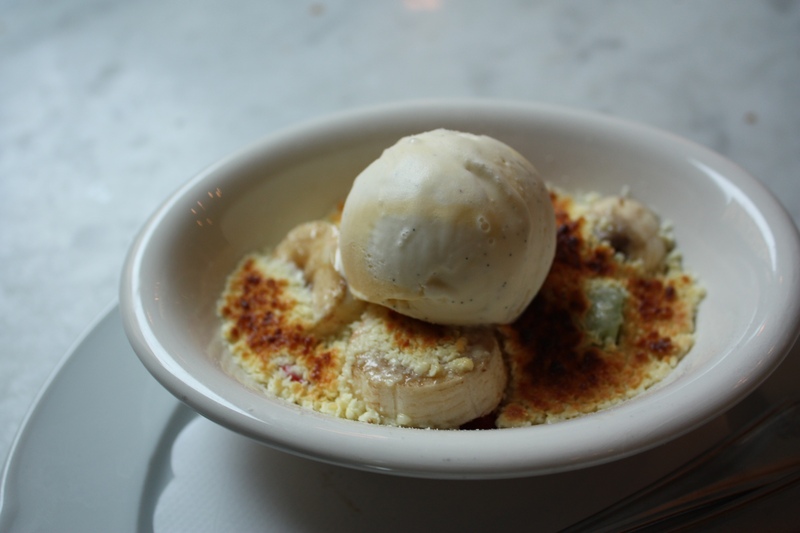 gino… this is a Swedish dessert.. fruits covered with grated white chocolate, baked and served with ice-cream.. The food here is inventive, tastes good and the portions are relatively large.. and kind of justifies the hefty price (1300 SEK around 200 CAD)! 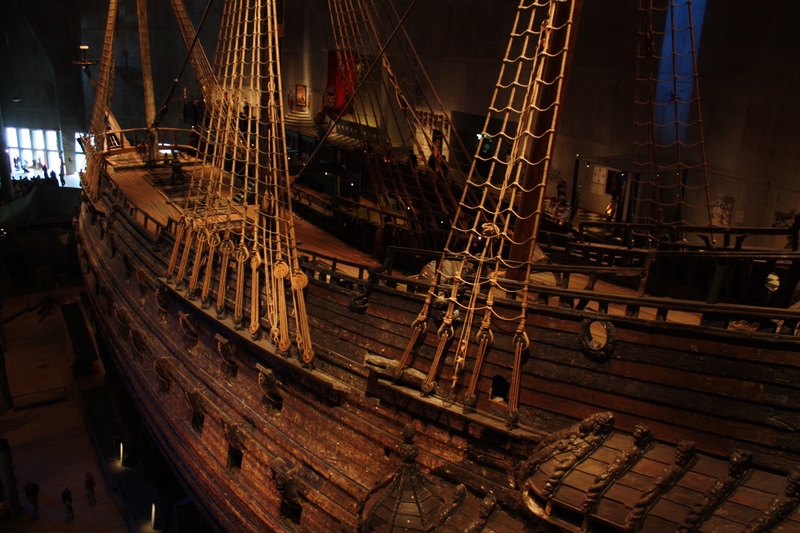 After visiting the Vasa Museum to see the ship which sunk on her maiden voyage…. 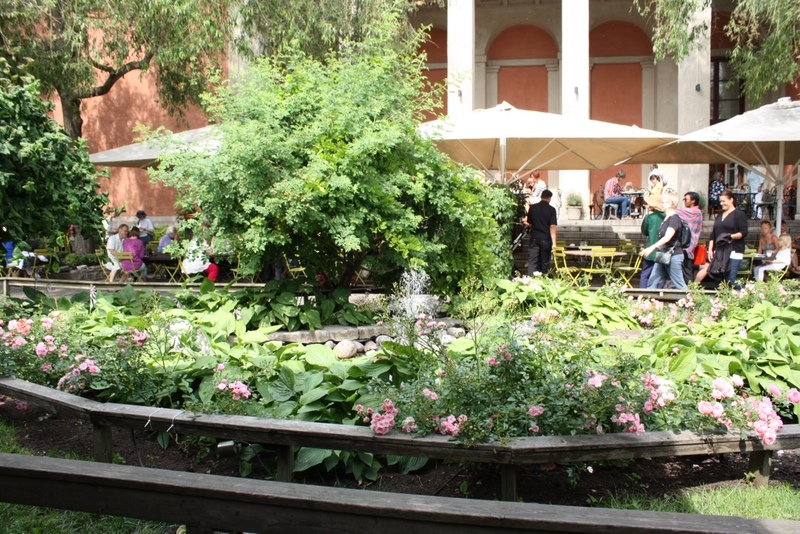 Blå Porten has a quaint and picturesque courtyard and it’s perfect for a summer day! This cafe is self-serve.. so we picked a few pastries from an assortment laid out on long wooden tables. 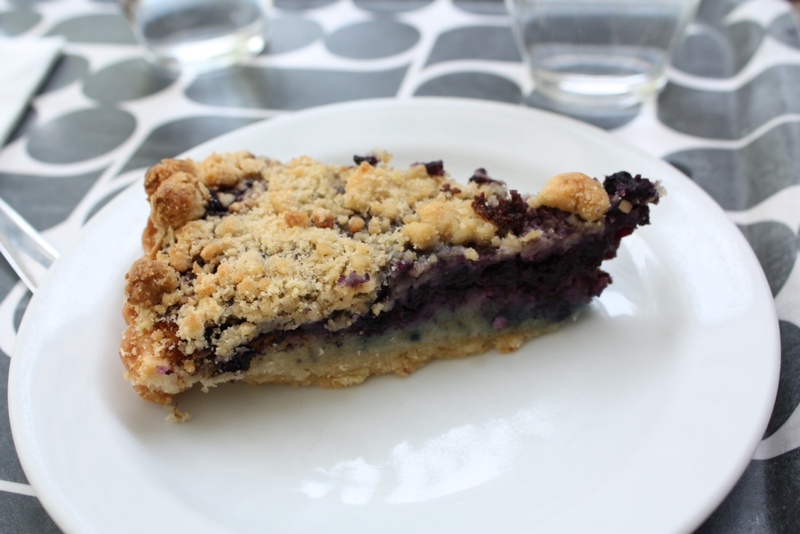 Blå Porten is the perfect place to eat and relax after a few hours at the museum! 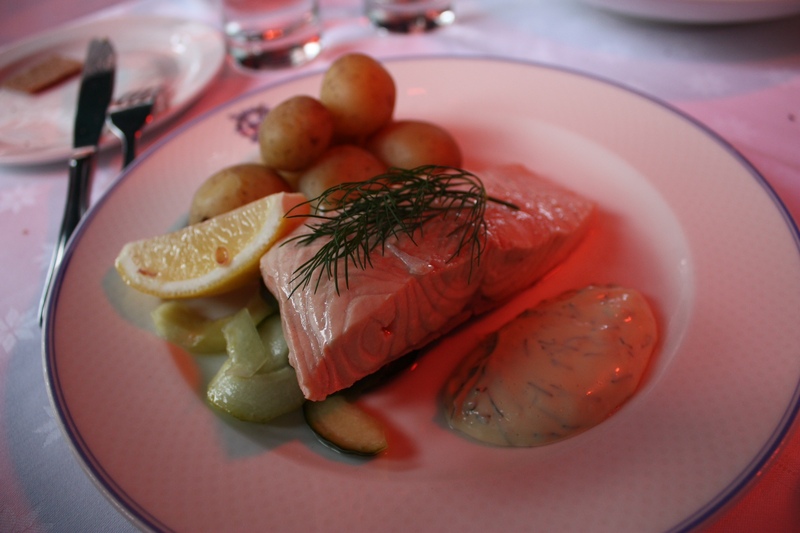 The Royal Swedish Opera isn’t just the national stage for opera and ballet but also the home of 2 restaurants, the expensive Operakällaren and the less-expensive Bakfickan. 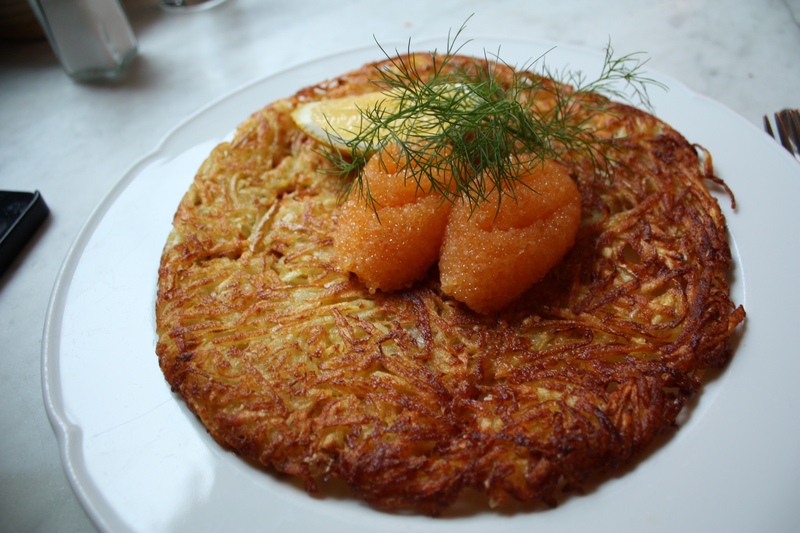 Bakfikan is famous for its traditional Swedish dishes and is extremely popular with the tourists! 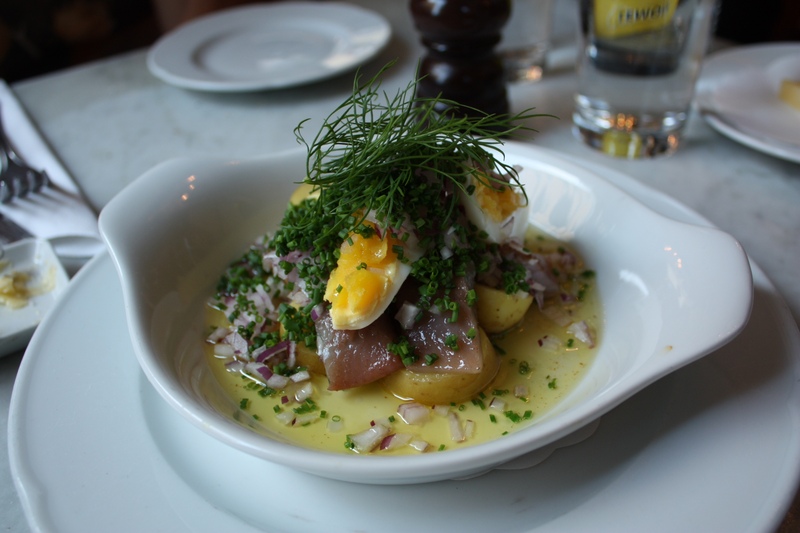 Lightly salted salmon with dill creamed potatoes…..
Diced tenderloin of beef, diced potatoes, fried onions and egg yolk… brother said this was the best dish he had in Sweden! I had the Swedish meatballs with potato purée served with lingonberry preserve and pickled gherkin but I ate it before taking a photo :(. I’ve never tried Swedish meatballs before (not even the ones from Ikea!) but it tasted like regular meatballs except it’s a lot larger! After crossing the bridge from Gamla Stan (Old Town) into Södermalm (the setting of Girl with the Dragon Tattoo), there’s a square where you can find the most famous food stall in Stockholm. 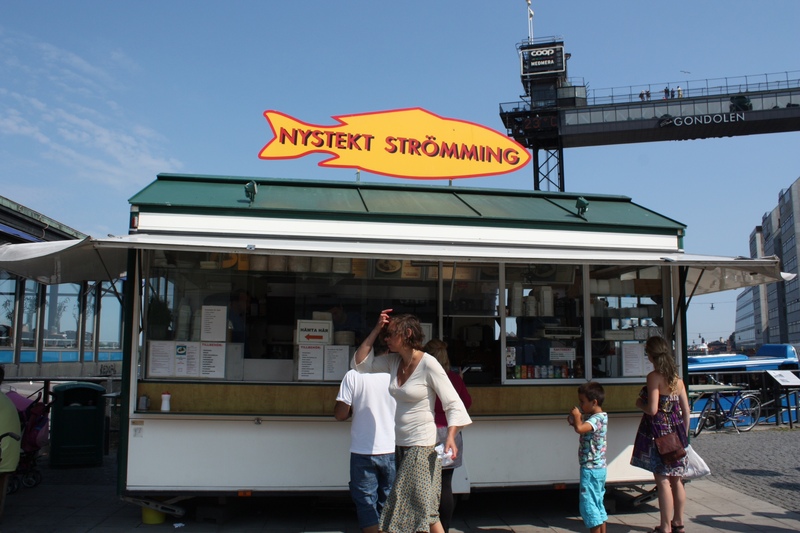 Nystekt Strömming (means newly fried herring) is famous for it’s fried herring (big surprise there)! 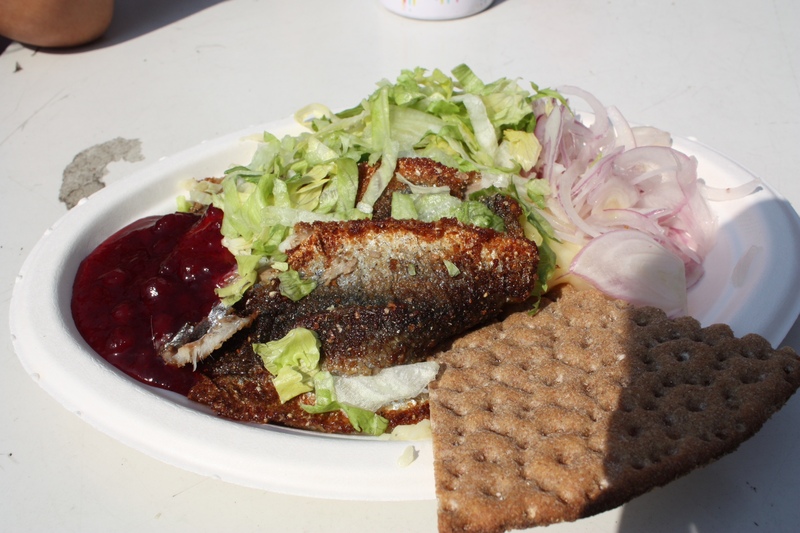 fried herring with mashed potato, lettuce, onion lingonberry sauce and knäckebrod (Swedish hard bread)…. 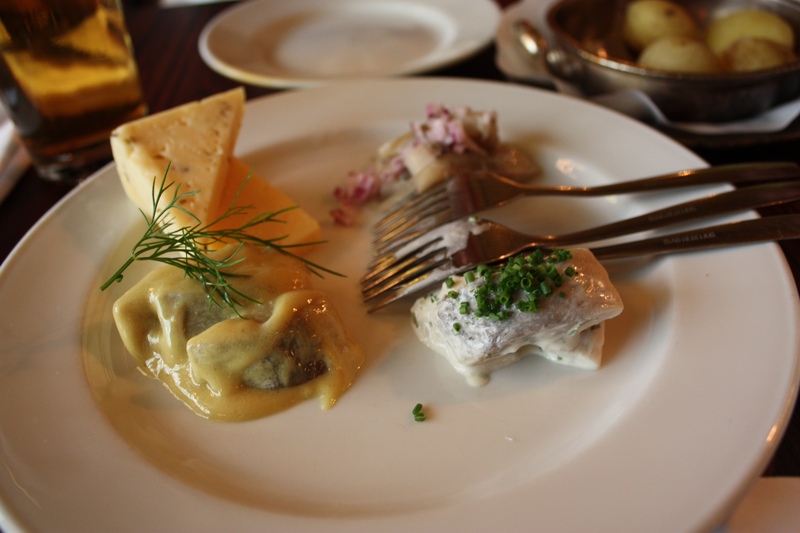 The herring wasn’t too oily and didn’t have a thick batter. Loved the lingonberry sauce.. not too sour! Lingonberry is a staple in Nordic cuisine. Again, to put into perspective how expensive Sweden is, this fast food costs around $12 CAD!